It’s important to get ready and know what to expect when it comes to the U.S. Citizenship Exam. Discover the many resources that will help get prepared. 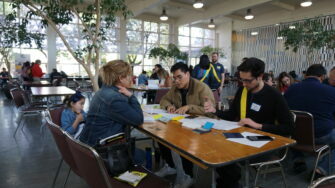 Prepare for the USCIS naturalization interview with the San Francisco Public Library’s helpful resources, including a guide to naturalization, detailed practice materials for the citizenship exam, and a list of local organizations that can help you with the naturalization process. You can also watch an informative short video to learn more about the the resources available at the library. .
USA Learns is also available in Spanish! This 16 minute video presentation provides a general overview of the naturalization process, including where to find immigration information and the general requirements for obtaining U.S. citizenship. There are 100 civics questions on the naturalization test. During the naturalization interview, applicants will be asked up to 10 questions from the list of 100 questions in English. You must answer correctly six (6) of the 10 questions to pass the civics test in English. Several study tools are available to help you prepare.